Large horizontal outdoor storage shed for trash, recycling, food and yard waste. Unlike your grandfathers outdoor shed and far better than your neighbour's plastic storage container, this triple-door horizontal refuse storage center provides a sturdy, stylish solution. Includes all the same great features as our smaller trash and recycling center, only this one is larger to accommodate various larger bin sizes for storing trash, recycling, food and yard waste. Weather and pest resistant. Crafted of solid wood harvested from the Cypress tree family with decay resistance similar to Western Red Cedar. Tongue and groove construction. Product size: 66W x 38D x 53H Internal size: 61W x 36D x (51H at back / 47H at front). Ships anywhere in North America. Large Horizontal Refuse Storage Shed Large horizontal outdoor storage shed for trash, recycling, food and yard waste. Unlike your grandfathers outdoor shed and far better than your neighbour's plastic storage container, this triple-door horizontal refuse storage center provides a sturdy, stylish solution. 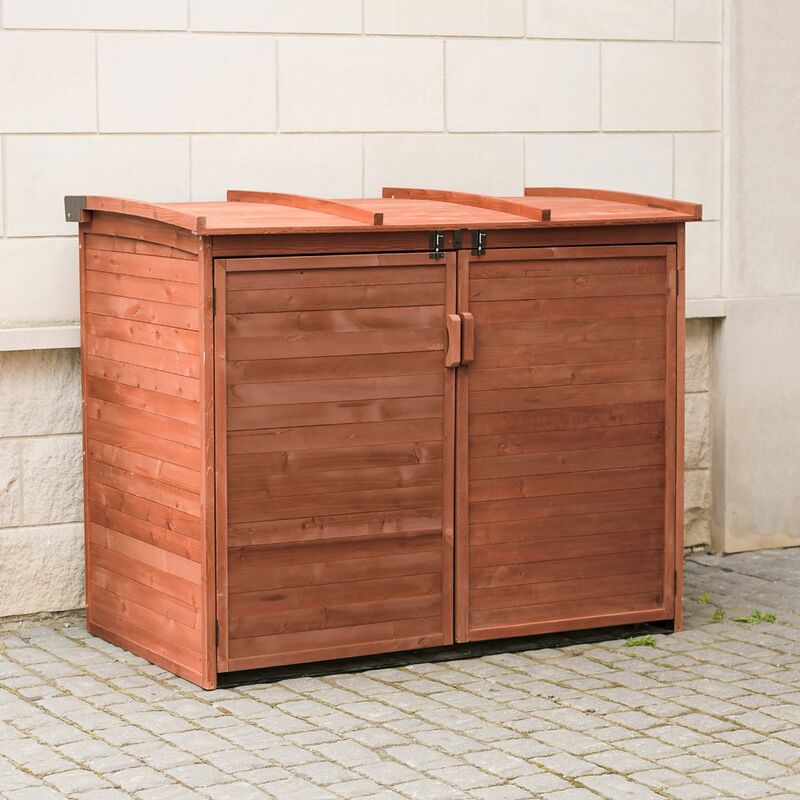 Includes all the same great features as our smaller trash and recycling center, only this one is larger to accommodate various larger bin sizes for storing trash, recycling, food and yard waste. Weather and pest resistant. Crafted of solid wood harvested from the Cypress tree family with decay resistance similar to Western Red Cedar. Tongue and groove construction. Product size: 66W x 38D x 53H Internal size: 61W x 36D x (51H at back / 47H at front). Ships anywhere in North America. Large Horizontal Refuse Storage Shed is rated 3.2 out of 5 by 31. Rated 1 out of 5 by Jeffrey from Poorly constructed and cheaply made. Definitely not worth the... Poorly constructed and cheaply made. Definitely not worth the money. Rated 5 out of 5 by Judes from Good looking, sturdy, does the job! This is the 2nd one I purchased. The first for for me, the 2nd for my nephew. He needed a unit to keep the raccoons out! and it worked great!! sturdy, roomy size, looks good, very happy with this purchase. Rated 4 out of 5 by Pam from It is very attractive looking - HOWEVER...the color is almost... It is very attractive looking - HOWEVER...the color is almost only a paper coating and scratches off very easily. And the doors don't come close enough to the ground to stop any small critters from getting in so I have to adapt something for that purpose. And yes, we followed the instructions to the letter. But we also added a floor - for better stability. so all in all - it wasn't as inexpensive as I had hoped. Rated 4 out of 5 by BBCB from Decent quality. Looks good. A little more yellow in color than what you might expect. It was m... Decent quality. Looks good. A little more yellow in color than what you might expect. It was missing the metal slider insert piece of on of the latches but fortunately I would rarely use that. My wife and I assembled. Took about two hours, we work well together and follow directions. Rated 2 out of 5 by James from The overall quality of this product was not worth the money spent. After assembling the product w... The overall quality of this product was not worth the money spent. After assembling the product with the picture instruction manual....the frame would not line up so that the doors would close properly. The product did not feel as sturdy as I would have expected for the price. The cover gives off a nice appearance on our porch but really is not a quality piece of an outdoor product that you would expect. Rated 1 out of 5 by KAF from This fell apart with the first wind. It lasted about... This fell apart with the first wind. It lasted about 1 month. So annoying.